The Phillies have continued the “legacy” of Philly teams being unstoppable in a year where we saw the Eagles win the Super Bowl. We saw the Sixers make a complete 180 degree turnaround from two years ago jumping 42 games in the win category, and make a run in the playoffs. The Flyers had a bad December and looked like they would miss the playoffs but they went on a run and snuck in. Now, with all those runs being over the focus shifts to the Phillies who are sitting in second place in the NL East after they were supposed to be rebuilding this year. 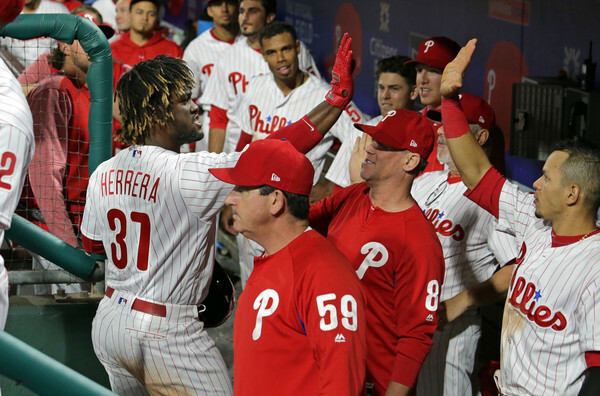 Part of the Phillies new found success is the fact that there star center fielder Odubel Herrera is hitting well above .300 and has an on base streak dating to last season. He is now finding the power side of hitting and currently has five home runs. He has had two games this year where he hit multiple home runs. The Phillies have also found out that Carlos Santana can in fact hit the ball and his early struggles were just a fluke. Santana had a terrible start to the year, but he was hitting the ball hard. His recent success also has seen him hit for power and he has hit home runs recently which is why the Phillies like him. If Santana can hit for power than he would make this Phillies lineup a pitching matchup nightmare, the first five spots would be filled by hitters who combine for not only power but high on base percentage and that gives everyone the chance to drive in runs. One of the prime examples of this working would be when they beat the San Francisco Giants 11-3 when Santana drove in five runs by himself. The Phillies have been quietly putting up a big run differences which is a big reason for them being up 39 runs in the run differential. With the top of the order producing the catcher position is now starting to be solidified by second year player Jorge Alfaro who provides power deep in the order. All this success can also be credited to the manager Gabe Kapler who is in his first year and has an interesting approach to the game. Kapler bases most of his decisions on analytics which made him a very hated guy in Philly in the first week of the season he now is being praised left and right, so what is the difference? The fact that he is now making decisions based on what he sees in the game not analytics, which he brings in when he needs too. In the beginning of the year he yanked Aaron Nola off the mound when he only had roughly 60 pitches and no runs given up, the Phillies went on to lose the game and it was in large part due to the fact that the bullpen had been used too early. He now lets his pitchers go deep into games and he is letting them go, it also does not hurt that the pitching rotation has been on fire recently, Nola is coming off a game where he had 12 strikeouts only to be followed up by Vince Velasquez having his own 12 strikeout game. The pitching staff has also seen some unsung heroes in Nick Pivetta and Jake Arrieta who both have been very dominant this year. Nola has only lost one game all year and looks like the pitcher for the foreseeable future, Pivetta is young and has time to develop, and they also have a few farm pitchers who are potential stars in the next few seasons. The other untalked about topic is the fact that the Phillies are this good and still have one of, if not the best farm systems in the league. With all the right pieces in place for them the Phillies have such a bright future and will look to turn into the league’s next dynasty. This can happen as long as the managing does not take a turn back to the start of the season and we will see that they can be dominate. Oh and one more thing remember this team is rebuilding so wait for what they have in store when they have a solid lineup and players.